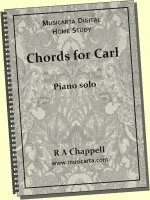 If you know how to find chords, you can make new musical versions of a piece working directly from the chord sequence. 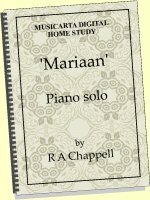 For example, you have already learnt how to play left-hand-over patterns for the introduction, bars 7 and 8 and the ending of your Pyramids performance. You can make a new version of Pyramids using this LH-over pattern for all the chords in the chord sequence – the ‘Left-hand-over Version’. 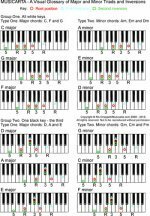 These are the piano keys you use for an A minor LH-over pattern. The spacing applies to all the chords in Pyramids except the E major chord, which substitutes the black G sharp for the middle chord tone in each hand. You can see what the LH-over pattern looks like in written-out music below. The LH-over pattern has twice as many notes as the six-note Basic Music-making Position pattern. Here is a LH-over pattern written out in six-eight, with the counting written in. 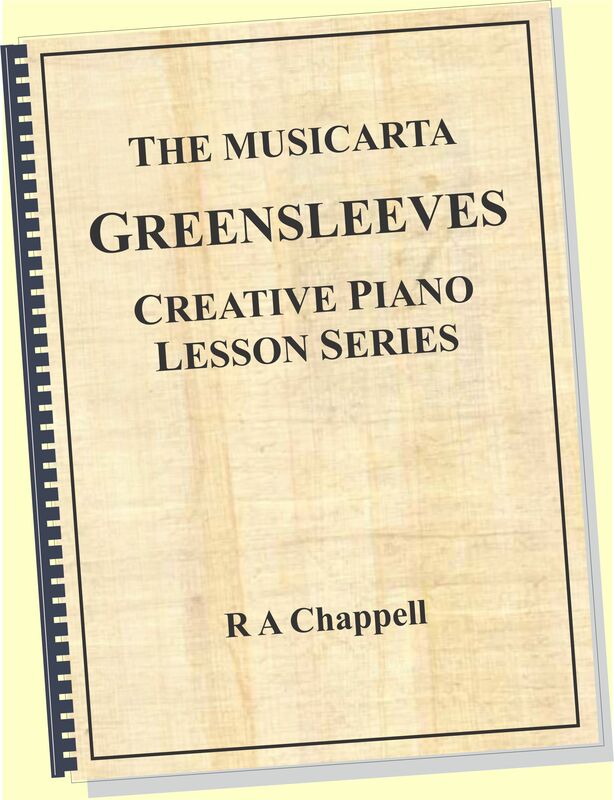 If we write the music for the LH-over Version ‘in twelve-eight’ – with twelve quavers to a bar – we can use the same chord chart as before, but play twelve notes – a LH-over pattern – for each chord symbol. Here is the same music written out in twelve-eight. The notes in twelve-eight come at exactly the same speed as the notes in six-eight, so one bar of twelve-eight is twice as long as a bar of six-eight. Play a LH-over Version of Pyramids, with one twelve-note LH-over pattern for each chord symbol in the chord sequence. The last note of a LH-over pattern is the middle note of the left hand chord. You jump from there to the root (name-note) of the next chord. In bars 7 and 8 you play two LH-over patterns – one for each E major chord symbol. Listen carefully to your ending (bars 15 and 16), to make sure it’s neither too long nor too short. One-and-a-half bars is a good length. Remember to play E major chords in bars 7, 8 and 14. 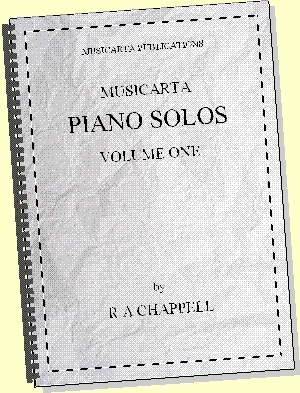 Here is a manuscript sample to work from, but try to play the LH-over Version without music, if you possibly can. Because the last note of a LH-over pattern is the middle note of the left-hand BMP chord, some of the joins between the patterns don’t sounds quite right. The middle note of a BMP chord is not a good final note for a pattern, as we found when we were looking for a LH-over ending (page 13). 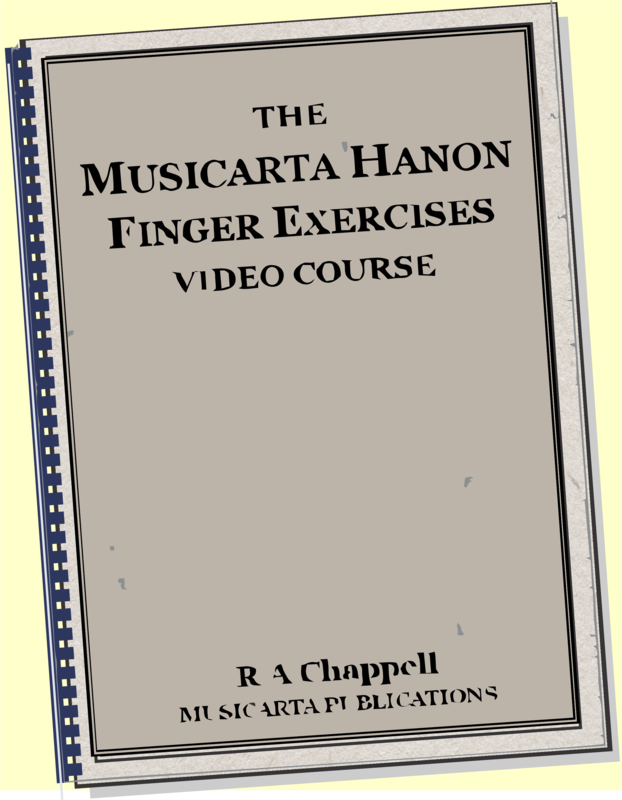 One thing we can do is make the RH thumb (on the way down) the last note of the LH-over pattern (as we did for one of our left-hand-over endings). This gives us a 10-note LH-over pattern, and two empty quaver ‘slots’ at the end of each bar. We are going to use these two empty slots to turn the zigzag Pyramids bass line (the line of the lowest notes) into more of a tune. But first, play through the Pyramids chord sequence using 10-note LH-over patterns. The first two bars are written out as an example, below. Here is the section performance. The bass line of a piece of music is the musical line that the lowest notes of a piece of music make. (Electric bass guitars and the string double bass often play the bass lines in popular music.) The notes of the bass line are usually the roots of the chords of the chord sequence, plus some notes in between to make the bass notes into a more interesting musical line. The Pyramids bass line – the zigzag pattern of the chord roots – is already quite noticeable. We are going to use the two empty quaver slots at the end of the ten-note LH-over pattern to make it more musical, by filling them with little bass-line tunes which approach the next root in an interesting way. 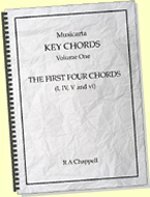 Let’s look at the possibilities in the first two chord changes. We’ll repeat the root of the current chord in the first of the two quaver slots, so that the listener remembers where we’re coming from. That leaves just one quaver slot before the root of the next chord, shown here by the question mark. White key G, between root A and root F, seems an obvious choice. We’ll put it in and call this three-note approach movement ‘Type One’. Type One movement walks by steps* to the next root. *A step in music is a movement to a note with a next-door letter-name: an F to a G, a C to a B, etc. Step-wise movement is always desirable in music – it’s ‘easy on the ear’. Look at the next chord change (F to G). There isn’t a white key between the repeated root F and our target note, the next root, G. Instead, jump over our target note to the note beyond (A) and fall back to the new root on the first beat of the new bar. We will call this approach movement ‘Type Two’. Type Two movement skips* to the other side of the target note (the next root), and then steps back to arrive. Notice these are again all small steps. *A skip movement ‘skips over’ one note letter-name to the note with the letter-name just the other side: an F to an A, or a G to a B (skipping A), for example. Movement patterns Types One and Two on their own are enough to develop nearly the whole bass line, as you can see in the chart that follows. Use full, 12-note LH-over patterns at the end of the first half, and one-and-a-half 12-note LH-over patterns for the ending. These are the approach movements in use so far. You need to work out how Type One gets you from G to E (bars 3 to 4). Remember that ‘Type One movement walks by steps to the next root'. You need to work out how Type Two gets you from E to F (bars 4 to 5). Remember that ‘Type Two movement skips to the other side of the target note then steps back to arrive’. Play the LH-over Version with the developed bass line as far as you can. Finally, we need a solution for the last empty cell in the table – F to E, bars 13 to 14. Before, when there wasn’t a note between the roots (for example, F to G, bars 2 to 3), we used Type Two, ascending. Here, we have the same situation, but going down (descending) instead of up, so we need to turn Type Two the other way up to get ‘Type Two, descending’. Across bars 13 to 14, the bass line will move like this. So you have arrived at the full performance. Now you can play a complete developed bass line version from this chord chart. The MS for this version is in your Workbook. Here is a reminder of the approach movements that are being used. Here is the scrolling MS video. When there’s no room for an ‘in-between note’, we use Type Two movement, which skips to the other side of the target note and then steps back to arrive. We can use the same trick even if there is room for an in-between note. The bass line will jump more than one note to the other side of the target note, then step back. This is our new Type Three approach movement – jump/step. Here are the first three bars of a bass line that uses a mix of movement Types One, Two and Three. The middle part of each bar has been cut out to fit the example into one line of music. You will supply the missing part of the LH-over pattern yourself. This is the chord chart for the whole of this version. We can make another bass line using only movement Types Two and Three. Here are the movement types you need for this version. You will find these two bass lines written out (in six-eight) in the next module.